Dawson Creek Part of the BC Adventure Network. Over a million web site visitors annually ! One of Dawson Creek's claims to fame is that it marks the start of the Alaska Highway; the stone cairn denoting the beginning of the highway is located in the Railway Park. Visitors from around the world have their pictures taken at the famous Mile "O" Post. 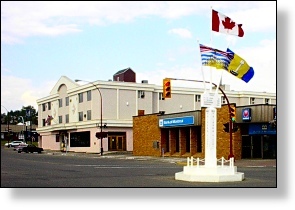 Located in downtown Dawson Creek, the Mile Zero Post symbolizes the beginning of the Alaska Highway. The Walter Wright Pioneer Village transports visitors back to the 1940's when the troops arrived to begin construction of the highway. By travelling north or south visitors can experience the beauty and excitement of the wilderness and enjoy some of the activities that can be had. Camping, fishing and hunting are all popular activities in the area as is hiking, biking, wildlife viewing, skiing and snowmobiling. The surrounding lakes provide a relaxing way to spend a summers afternoon swimming, boating or fishing. Nearby Provincial Parks offer a range of activities from backcountry hiking and backpacking to camping and cross country skiing. The town itself contains an interesting mix of shops, museums and galleries, while the sports enthusiast will find an aquatic centre, ball fields and skating or curling rinks. Something for everyone. Climate: January average: -18'c. � July average: 15'c. 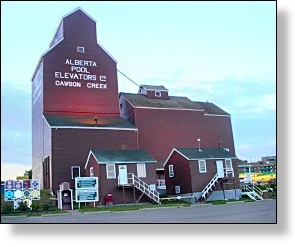 Access: Dawson Creek is 102 km ( 63 mi.) north of Chetwynd on Highway 97 and 412 km (256 mi.) northeast of Prince George. The area is also serviced by air and bus service. Accommodations: Visitors can choose from a variety of hotel/motel accommodations or take advantage of the campsites and nearby provincial parks.